Sign in to the Cold Chain portal. Select the appropriate user then click the Edit icon. Attribute column includes check marks indicating the sensor data available from the device. 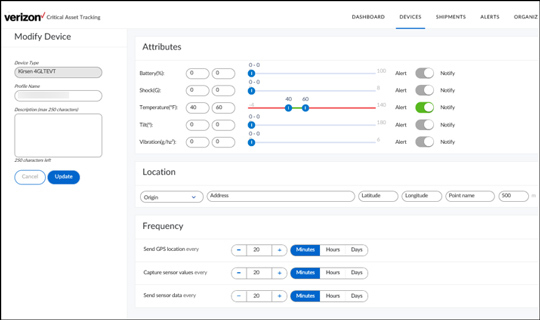 No data graph for a sensor attribute that is not supported or available with a tracking device. Legend is a non-editable field for sensor attributes. Excursion Duration is the length of time an excursion exists before an alert is generated. Recommended setting is zero (0) for real-time notifications. Notify Limit determines the number of alerts generated per excursion. Two (2) is the recommended setting to send one alert when a threshold is exceeded and a second upon the excursion being resolved. Show Graph displays data values on the ‘data’ tab (accessed through the Dashboard).